With many of our customers looking at alternative options for island cooking and extraction we thought we would take a look at venting hobs. Since the introduction of the Bora Basic venting hobs with an inovative all in one appliance (cooking and ventilation) was introduced many alternatives have popped up on the market. Venting hobs offer an all in one appliance which is stylish and aestheticly pleasing which offers many soloutions in kitchen design creating open living spaces with no extractors blocking line of vision and in some cases a cost saving soloution in the kitchen. The idea of a venting hob is to capture vapous and steam before they get into line of vision or into the room by drawing the air directly at bench height. The venting hobshave a cross flow which is greater than the rising steam or vapour, which is then sucked back down into the vent. It’s worth noting that venting hobs are only effective to a certain height, some tall pans may still alow vapours to rise above the cross flow and if using a downdraft the pans need to be in front of the downdraft to be effective. Each model offers differnt features which are listed on the Bora website . The BHU has a maximum extraction rate of 624 m³/h recirculating with the BFIU running upto 658.8 m³/h recirculating. Venting the BFIA externaly the hob can extract at a rate of 697.3 m³/h. The BFIA boasts additional features such as; automatic heat up function, bridging function, power settings for all cooking zones, Timer function, residual heat display, pan size recognition, pause function, warming function, childproofing feature, safty shut-down and power management offering an impressive peice of kit. The Neff Flex Induction Venting Hob Ceramic glass on stainless steel trim. The Neff Flex Induction Venting hob offers an alternative design to the Bora with the rectangular shaped vent in the centre and a stainless steel trim finished around the hob. At 80cm wide air venting flex induction hob is a four-zone flex induction hob combined with an integrated extraction unit. It is suitable for ducted extraction or recirculation in one hob. 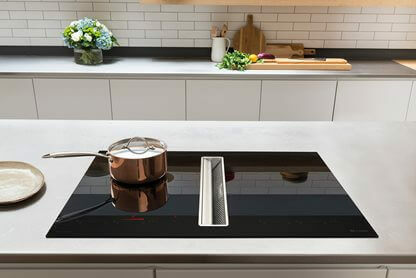 Neff’s venting hob comes as standard with features found already within its range of induction hobs such as the FlexInduction the FlexZone lets you place your pots and pans anywhere you want and heats them exactly where they stand, auto detecting the pan size. The TwistPad® Fire is another nice feature, it’s a removable, magnetic, illuminated control knob that gives you precise, convenient control over all cooking zones, to make things even easier, only the selectable functions are illuminated keeping cooking simple. Two other stand out features included; PowerMove the FlexZone is divided into three heating zones: boiling in front, simmering in the middle and warming in the rear. Then another feature called FryingSensor with 5 selectable temperature settings monitors the set temperature and holds it steady. So there’s no more burning. Recirculating the extractor, extraction runs upto 557 m3/h with a boost taking it to 618 m3/h for more intensive use. Venting the extractor outside takes the movement to 690 m3/h maximum. Neff also claim a Grease filter efficiency of 90% and an odour reduction rate of 85% when cooking. 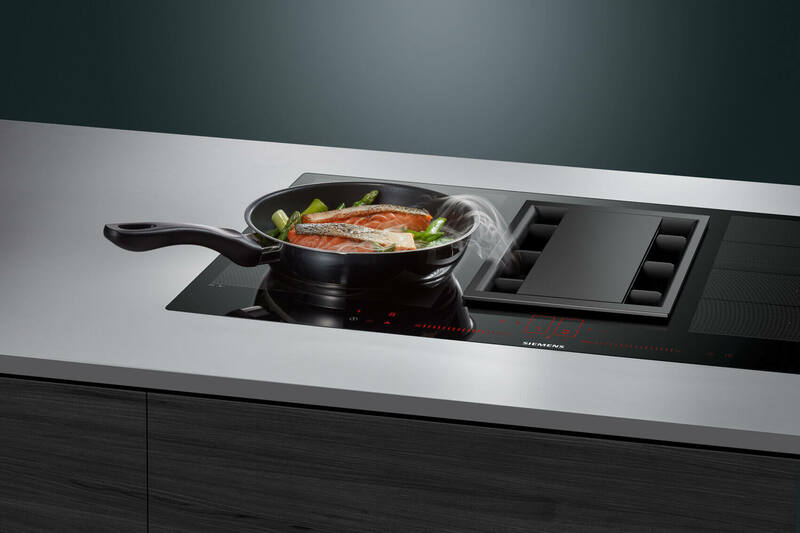 The Siemens induction air hob is probably our favourite in terms of its design and functions, similar to the Neff Flex induction Venting hob it boasts similar features with the addition of the cookingSensor Plus– No more overboiling. Just attach the sensor to the pan and it will interact with the hob, signalling when a certain temperature has been reached and keeping it at that exact level. Another additional featuer is the duallightSlider which lets you easily and intuitively operate the hob. Featuring just like the Neff you get the flex induction which is self adapting to pan size and PowerMove Pluswhich enables intuitive control thanks to three heating zones with different temperatures, just by moving the pan. 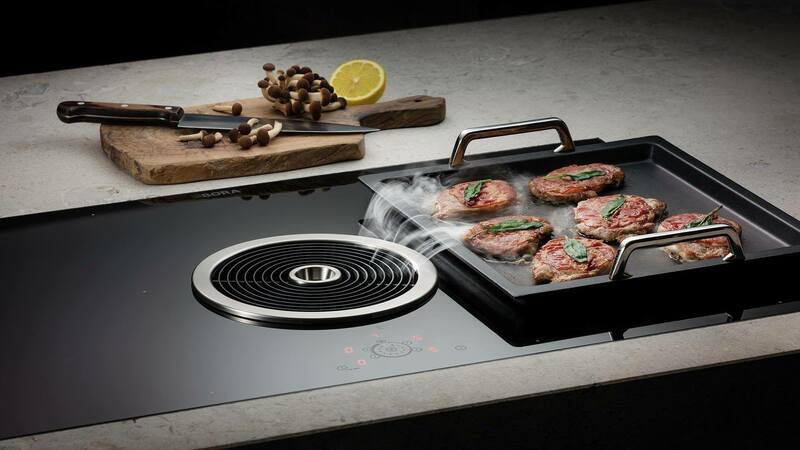 The extractor is slightly different with the Siemens induction air hob, featuring iQdrive, The iQdrive is their most efficient, most durable and most powerful brushless motor, designed to operate your hood with maximum extraction performance and at the same time lowering the sound level. The ClimateControl Sensor, Once activated, the climateControl Sensor takes care of all ventilation level adjustments for you, controlling normal as well as intensive levels. The sensor constantly detects the level of odours in the air and automatically adjusts the motor level. This fully automatic control of the hood means you can focus on your cooking and ensures you have the most efficient and quietest extraction level selected at all times. Re-circulated air movement runs upto 630 m3/h and vented 690 m3/h. Again as per the Neff model it has a Grease filter efficiency of 90% and an odour reduction rate of 85% when cooking. 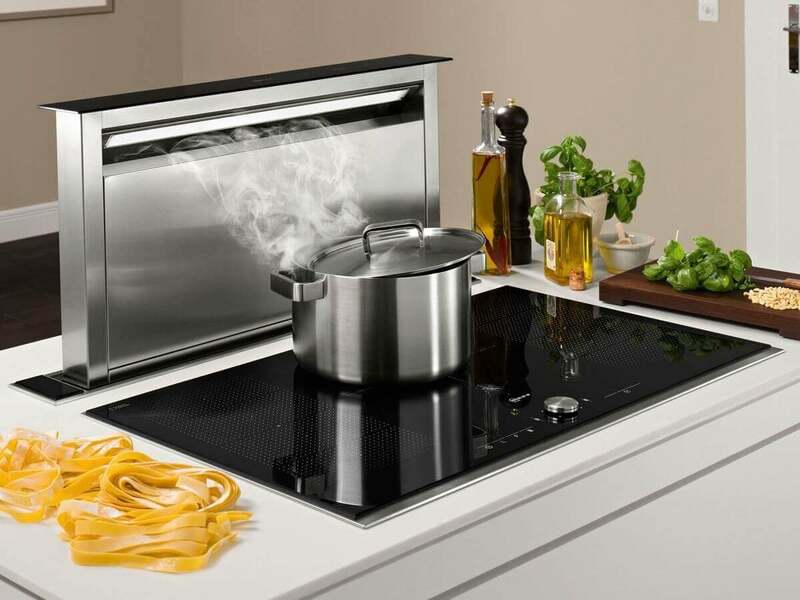 Another stylish hob to concider is Caple’s Induction downdraft extractor a 90cm wide air venting induction hob. A combined induction hob and extractor from Caple finished in black glass. It consists of a four-zone induction hob with bridge function and an integrated extractor with a motor designed to fit behind your plinth. The extractor can be used in ducted mode using 150mm ducting or recirculated mode using the optional recirculation kit. This hob features all the basic functins you would expect, including Bridging function, child locks, 10 power level displays for each hob and slider touch controls. The Extractor has the optional feature of installing a Plasma box which is an efficient way of removing orders and allows the charcoal filters to last around 5 years longer. The grease and moisture is captured in the 12 stage aluminium grease filter. The contaminated air stream (odours, vapours, etc.) is converted by a chemical reaction in the Plasma Filter, the air is then passed through a carbon filter and clean air is recirculated back into the room. An alternative soloution to venting hobs is the use of a seperate downdraft, taking up a little more space the downdraft offers directional lighting and stronger extraction, with the Neff (I99L59N0GB) extractng 710 m³/h. It also runs relativly quiet at respectivly quite 61db. The Neff downdraft also looks good when entertaining with motorised up and down motion it creates a talking point within the kitchen. Most downdrafts can be ducted or recirculated.